All of the words you filled in there will be filtered out and replaced by the respective target language keywords. 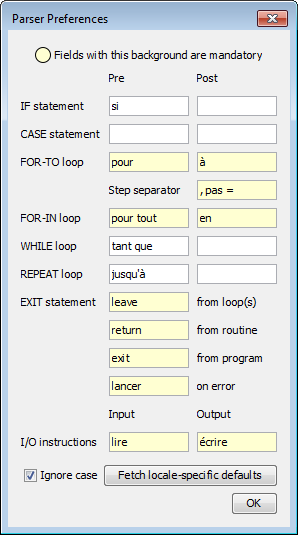 As you can notice, the words "pour" and "à" have been eliminated or replaced with whatever the exported code requires. For being able to do this, the generators must be fed the necessary information about the syntax you are using in your diagrams. To export a diagram as code, go to the menu and select "File => Export => Code ..." and the name of the language you want to export to. You should be aware, of course, that the generated program files will usually not immediately be compilable or executable in the target language but require some manual post-processing because the generators will have to do a lot of mere guesswork: Though Structorizer tries hard to derive static type information from assignments or implicit declarations, the types of many of the used variables will not be known such that the generators will hardly be able to produce complete declaration lists for languages that require strict declaration. You will have to check for wrong, missing or mis-placed declarations and must accomplish or correct them manually. Some algorithmic construct may not directly be translatable such that the generators must try their best to compose something closely equivalent. Usually "TODO" comments inserted in the generated code will guide you through the manual post-processing work. The Export Option "No conversion of the expression/instruction contents" allows you to perform a kind of raw export with mere control structure conversion and mostly suppressed translation of the element contents. It is recommended to use this option if you explicitly write target code in Structorizer elements. In this case Structorizer wouldn't know how to translate your code into any other language, though. Export Option "Involve called subroutines" is to enrich the code for the selected diagram with the routine definitions for all subroutines referred to by contained CALL elements - if the corresponding diagrams are reachable via the Arranger. Unavailable subroutines the exported diagram depends on will be reported without aborting the export process (the definitions will simply be missing in the resulting file(s)). You may find hints for missing subroutines in advance in the Analyser Report List if Analyser Preference "Check for inappropriate subroutine CALLs and missing call targets" is enabled. The scripts can be found in the Structorizer installation directory; don't try with Structorizer.exe! The Java WebStart installation is not suited, either - you need the unzipped downloadable version. -a ensures that the attributes like author, creation time, and license text or link of the diagram will also be exported to the code file(s). -b sets the opening block brace for the body of compound statements at the beginning of the next line (otherwise to the end of the same line). -c will export simple instructions as comments. -l will create line numbers and more ancient-style code on BASIC export. -t will suppress most transformations of instruction and expression contents (intended for the case that the Structorizer elements already contain code complying with the target language syntax). -e ("encoding", followed by a charset name) determines the output file character set (UTF-8 being the default). -f forces overwriting an existing file with same name as the designated output file (see -o), otherwise a name modification by an added or incremented counter is made (e.g. output.cpp -> output.0.cpp). -o (followed by a file path or name) specifies a specific output file name. If not given then the output file name will be derived from the first nsd file name by replacing the file name extension with the one associated to the target language, e.g. ".java". The target-language-specific file name extension is ensured in either case. If several nsd files are given then without option -o the created file will be named after the first nsd file name; with option -o, however, the filename of the option will be used. - (single minus sign) will direct the code to the standard output instead of to the default output file. If -o option is also given, then the result will be written both to standard output and to the specified output file. lines. Each arrangement file will also feed an own source code file, where some separator lines will be placed among the explicitly specified roots. But be aware, that the additionally exported referenced routines may be shared among them. Note that the parser preferences configured in interactive Structorizer mode will be valid here, whereas the export options configured in interactive mode are not valid here, only the command line options described above will be observed (for binary options, the contrary of the described option effect being the default, e.g. without specifying -l option there won't be line numbers or other old-fashioned relics in BASIC output). The export option "Involve called subroutines" will automatically be enabled for arrangements and disabled for loose diagram files. Since release 3.27, the original Turtleizer package sources from Structorizer are available for separate download and may be integrated in the Java project you set up around your exported code. You will also need the diagrcontrol package as an interface it relies on. Both packages require at least Java 8 as platform. The exported Java file will automatically be prepared to work with this package. For C++, there is a functionally equivalent VisualStudio project Turtleizer_CPP available on GitHub that can at least be used by console applications under Windows -- either as static library (after having updated the project file to your VisualStudio version) or simply by integrating the header and code files in your C++ project. Your exported C++ file will just have to include the "Turtleizer.h" header and possibly to add a Turtleizer::awaitClose(); instruction (provided the other project settings are suited, see the README.md file in the download for details).